Bright Shire (1866-1994) was in north-east Victoria occupying much of Victoria's alpine area and extending westwards to Myrtleford Shire. Its north-west corner was the Mount Buffalo plateau. The shire's alpine and sub-alpine areas were traversed by the Ovens River (with headwaters near Mount Hotham) and the Kiewa River (with headwaters near Falls Creek). The shire was named after the township of Bright, one of numerous towns formed along the Ovens River, initially for gold mining and later for agriculture. Bright and nearby Porepunkah were also tourist stopovers for travellers visiting Mount Buffalo, and Bright has become an important holiday place, particularly during autumn. The road south of Bright leads to Harrietville and Mount Hotham, both popular holiday, walking or skiing resorts. In the Kiewa Valley there are Tawonga, Mount Beauty and the alpine road to Falls Creek. The Bogong High Plains are also reached from that route. The shire included the Myrtleford region, the area's most agriculturally productive component. Myrtleford Shire was severed on 17 May 1960. The severance briefly preceded tourism growth in Bright in the 1970s and the development of Falls Creek. Access to the shire was from the west via the Ovens Highway or the railway (1890-1983) from Wangaratta. The route led to Harrietville and Mount Hotham, and further to Omeo, Gippsland. (Access from Omeo had been useful for supplying the Ovens goldfields.) Directly east there was a road to Mount Beauty, ending at the Falls Creek resort. Bright Shire had over 1000 accommodation rooms and over 2000 cabins and camp sites in 1994. Farming occupied 24% of the shire's area of 3108 square kilometres in 1994. There were 9950 meat cattle, 2080 dairy cattle, little other livestock and an apple harvest of 5.5 million kilograms. There are also extensive softwood plantations on the lower hills adjoining the Ovens Valley. Mount Buffalo and the ski resorts are enclosed by national parks. 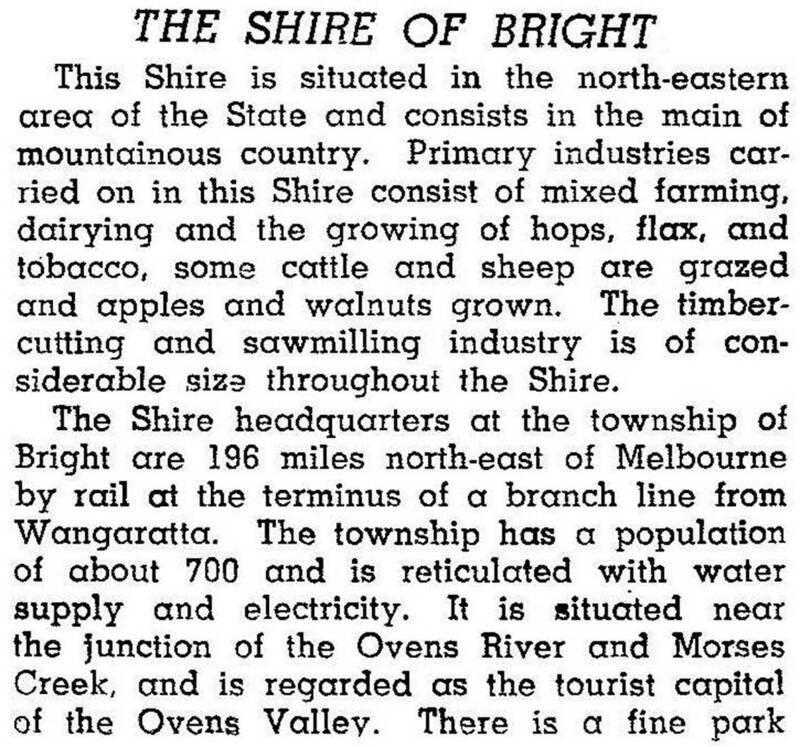 On 18 November 1994, Bright Shire was united with Myrtleford Shire and parts of Beechworth, Omeo, Oxley and Yackandandah Shires to form Alpine Shire.